Will Vaus, pastor of the Stowe Community Church, is the author of 13 books and has lectured extensively on the life and writings of C.S. Lewis. Lewis is one of the intellectual giants of the twentieth century and arguably one of the most influential writers of his day. Lewis wrote more than 30 books, including The Chronicles of Narnia, which to date has sold over 100 million copies and been transformed into three major motion pictures. What happened in Vermont when the anti-Communist fear known as the “Red Scare” swept the country? Quite a bit, as it turns out. Rick Winston will explore some forgotten history as we see how a small, rural “rock-ribbed Republican” state with a historically libertarian streak handled the hysteria of the time. What is Lord Bryon’s sword doing in Vermont and why did we formerly celebrate “Dewey Day”? Join Vermont Historical Society Executive Director Stephen Perkins for a special presentation featuring some of the amazing and intriguing objects in the Society’s collections. See treasures that may never have been on display, hear the stories behind them, and learn how they helped shape Vermont’s story. This lecture is co-sponsored with the Stowe Historical Society. UVM Professor Wolfgang Mieder, widely considered the world’s leading scholar in the study of proverbs, will discuss the origin of the “Pied Piper of Hamlin” legend in the 13th century, its dissemination far beyond Germany and its meaning. Who can you think of who might well have been ambiguous pied pipers leading people astray or to a better world? This lecture, sponsored by the Stowe Free Library, is free of charge, and is made possible by a grant from the Copley Fund. Dr. Al Hardy, an Oral Facial Surgeon and attending physician at UVM, has treated patients for snoring and sleep apnea for 25 years and has a private practice in Stowe. His presentation will include a broad discussion of sleep, how and why we sleep, what happens when we don’t sleep enough, and ways to get better sleep. Benjamin H. Kaestner III (Hank), bird-watcher and photographer, will show us a geographical transect of Ecuador, visiting a series of eco-tourism lodges that help protect the environment and provide jobs for the locals. For many years Hank has pursued his hobby of photography and has seen more than 7,100 species while traveling to remote and fascinating corners of the globe. Dr. Rick Barnett, Psy.D., M.S. LADC., is a clinical psychologist and addiction specialist in private practice in Stowe. He has served on a number of State boards and is Legislative Chair and a Past-President of the Vermont Psychological Association. Connecting with others, above all else, enhances our lives. This talk will review recent research on connecting as we age as well as what this means in an increasingly digital world. Theresa Snow, Founder and Executive Director of Salvation Farms, has received both regional and national awards for her work. Salvation Farms has been making wholesome, Vermont grown crops available to communities through gleaning, the act of collecting and distributing surplus crops. Theresa will share her steadfast conviction for the responsible stewardship and use of our natural resources with a parallel dedication to the engagement of individuals across socio-economical demographics in the work that she leads. Katherine Bielawa Stamper is the daughter of Polish immigrants. She is a graduate of Framingham State University and has a M.A. in Public Administration from the University of Pittsburgh. She spent two years studying Polish Philology and History at the Jagiellonian University in Krakow, Poland from 1984-1986. She will talk about her experiences with Poland’s waning years of communism and the Chernobyl nuclear disaster. 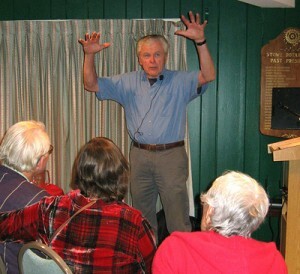 Membership in your local OLLI (Osher Lifelong Learning Institute) entitles you to attend programs at any of the other 7 OLLI sites throughout Vermont, as well as EEE-Burlington (Elder Education Enrichment). Your active OLLI membership also entitles you to the discounted member rate for the OLLI programs on the UVM campus. Simply present your membership card during the corresponding semester. Payment of membership dues entitles subscribers to attend all sessions of the series. Membership dues for the session series are $30.00 or $5.00 for a single session. Make checks payable to The University of Vermont. For a complete listing of all programs, see our listing in a pdf format.